contribution to the GAA and in particular to the St Malachy’s Club is unmeasurable. a SFC medal with the town in 1934 and in the same year won a Feis medal in what was the first ever Feis Sevens. they took the field – which with seven sons was very frequently. Championship medals in 1949. 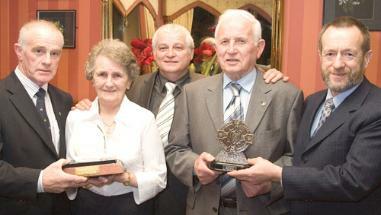 All four sons are recipients of St Malachy’s ‘Hall of Fame Awards’. eventually went off the road in the early 1980’s. said for Club fund raising or jersey repairing, Bessie could always be relied on to help out her beloved Club. weather roaring out support for the town. are playing and coaching Gaelic for the town Club and many other GAA clubs as well. until he stepped down as Club Chairman in 1986 has been equalled by few and surpassed by no one. necessary few pounds to keep the Club ticking over. career until the Club was safely out of debt some ten years later. receive a fair amount of banter from former pupils. outstanding service to the Club. marked his uncle during the match and much to the delight of the crowd bagged a handful of goals. against the barbed wire the ball was eventually kicked out of the field and out of view, and a pioneer pin did the rest. an Dúin) medals that he won with the town, as well as Down Div 1. League winners medal in 1955.
unable to attend training and was dropped from the panel and missed the final. Dan has also got Dr Logan Cup medal. Ireland semi-finals both to Kildare, in the space of a fortnight. During this same period Dan was also Club Secretary, and still made time to manage the senior team, along with Fr. 1965 won the County Championship. to win the 1968 All-Ireland SFC, the National League, the Wembley Tournament, also winning in New York. 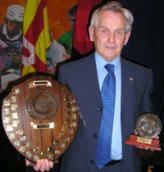 Down Hall of Fame Award in…… following in the footsteps of that other great Clubman John O’Hare. Centenary in 2006 you can be sure he will be called upon again to provide much needed information. 1984, 1989 and 1994 respectively. A magnificent achievement that the Castlewellan Rooney Clan can be truly proud of. footballers, and their local club, namely the Rooneys of ‘the cut’. voluntary basis by the small band of club drivers. Castlewellan players dreaded, as they knew his sense of fair play would always err on the side of the visitors. responsible for co-ordinating referees in the county. of those whose dedication has fostered and enriched the Spirit of Down". Administration; T P Murphy RIP, received by Mrs Josephine Murphy. but on the other side of the atlantic ocean where he immigrated to in the mid eighties. Rooney tradition of promoting Gaelic sport, remembering of course that he is a Rooney from ‘the cut’. 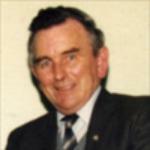 the close of the 20th centuary there has always been at least one Rooney brother on a Castlewellan GAC committee. 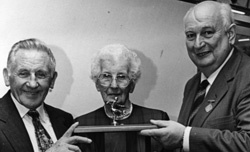 Frankie was Club treasurer from 1967 until 1982.
when the team won the Down u16 championship in 1953, and collecting his second U16 medal two years later in 1955. League medal in 1964 – and a second SFC medal in 1965 along with numerous 7-a-side and tournament honours. St Malachy’s Club complete with new pitch changing rooms, and a social club into reality. share of voluntary shifts behind the bar, a task he continued for many years after the social club was firmly established. give their services entirely free often taking time off work and at week-ends do this important club work. team sponsor and remains a generous benefactor to the town Club. medal in 1965 when the Town defeated Clonduff once again in the county final. teams, and county supporters alike, but also by the Legion of Mary, on their many trips to places like Knock in Co.
length and breadth of Ireland returning home in the early hours of the next day. derogatory to say about his beloved Town team, and always fit to hold his corner in a good argument. brothers Dan, Pat, and Frankie not forgetting their mother Bessie. A truly remarkable and dedicated town GAA family. Club rep on the East Down Committee with special Guest and former GAA President Sean Kelly. Award for outstanding services to her club during her lifetime. Club's Irish dancing team also won an All-Ireland CCD title in the same year. In the early 1990's Aggie was again involved with the formation of the first ladies football team in the town. ‘Town’ to their 10th Down senior football championship title in 1995.
becoming the 6th member of the Rooney family to be enrolled in the Club Hall OF Fame.